A Calvinist, a Methodist, a Catholic Priest and a Jewish Rabbi walk onto a ship… No, this is not the start of another lame joke, but a celebration of four men whose heroic actions are not remembered as much anymore. Sixty years ago last week, at the height of conflict in World War II, these four U.S. Army chaplains engaged in an act of heroism that is scarcely seen. As their ship sank, they took off their life vests and gave them away to soldiers on board, knowing that sinking in the frigid North Atlantic was a certain death sentence. 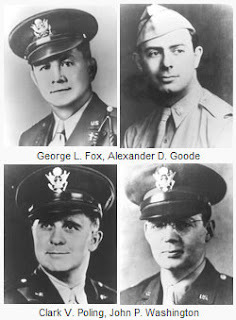 Lt. George L. Fox, Lt. Alexander D. Goode, Lt. John P. Washington, and Lt. Clark V. Poling laid down their lives willingly as an act of service to their God and to their fellow men. During WWII, many passenger cruise ships were converted into troop transports for the war effort. The USAT Dorchester wwas a smaller vessel, designed to carry about 314 passengers and crew up and down the East coast. After conversion, it would hold over three times more, with over 900 soldiers and ship's crew boarding on January 23, 1943 to cross the Atlantic to support the fighting in Europe. German submarines, or U-boats, had attacked troop transports before, so the captain sailed outside the shipping lanes and had "ordered the men to sleep in their clothing and keep life jackets on. Many soldiers sleeping deep in the ship's hold disregarded the order because of the engine's heat. Others ignored it because the life jackets were uncomfortable." Once on deck, the chaplains began passing out life jackets to the men, but found out that there were too few for all the passengers aboard. Then, as survivors Grady Clark and John Ladd reported, all four of the chaplains took off their own jackets and gave them to others. "It was the finest thing I have seen or hope to see this side of heaven," said Ladd. The Chaplains locked arms, sang and prayed for the men as the Dorchester sank with them on board. Steven Weinberg once said "Good people can behave well and bad people can do evil; but for good people to do evil--that takes religion." New Atheists such as Richard Dawkins and Christopher Hitchens decry religion as something harmful, that it "poisons everything." Well, here is just one example of the contrary. There were many good people on the Dorchester, many who were ready to give their lives for the war effort. But there were only four men who were so selfless that they offered others a chance at life to their own demise. It was because of their belief in God that they did so, not in spite of it. We would do well to continue to remember these brave chaplains. "The Saga of the Four Chaplains". The Four Chaplains Memorial Foundation. 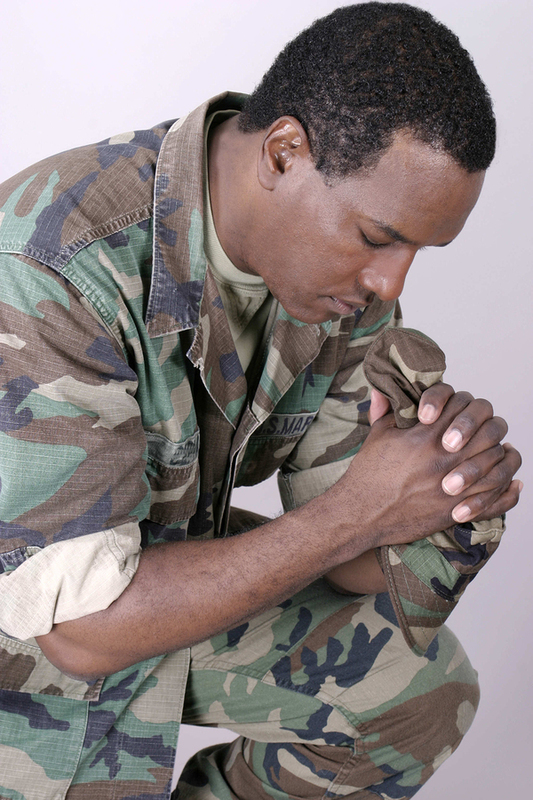 How is moral relativism affecting our young men and women in the armed services? It affects them quite a bit, actually. In this interview, I talk with Ratio Christi's Keith Kendrex and Dr. Enuel Hernandez, a US Navy chaplain who works with active duty marines, about the problem of relativism as it's found in our churches and universities, and especially within the military. As reported by NBC among others, the military suicide rate hit a record high in 2012. Moral relativism is one of the crises that help propel this number ever higher.